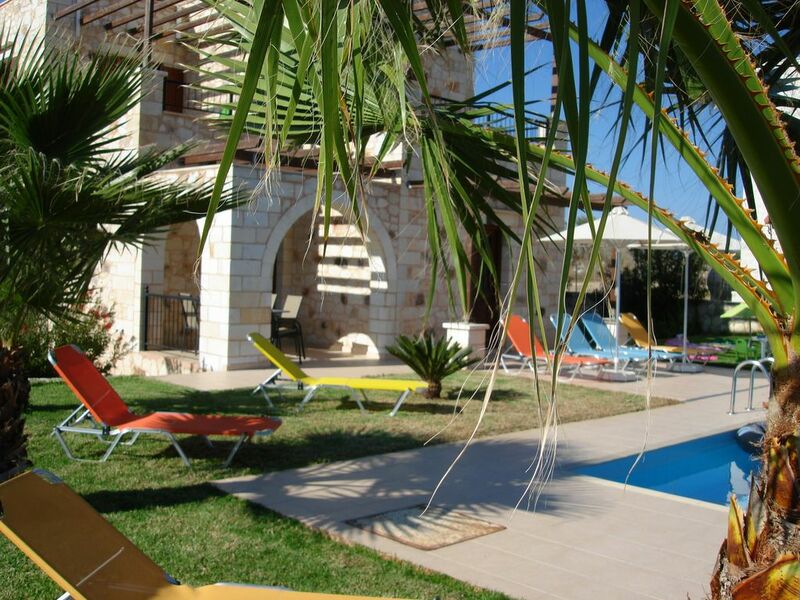 Villa in Kefalas, Chania, Crete, Greece - Secluded and Peaceful, Beach and Restaurants Within 5 to 10 Minutes Drive. Exclusive, secluded and peaceful villa with stunning view of Sea and White Mountain, with own private infinity swimming pool in Kefalas, overlooking onto Almyros Gulf Bay on the Northeast of Chania region. Closest beach Almirida, Kalives and Georgioupoli, 15 to 20 minutes drive. Closest Airport in Chania, 45 minutes drive. Local facilities and amenities like supermarket, tavernas in Kefalas village, less than 15 minutes walk. Stunning Sea and Mountains view. Guest review will clearly shows why you should choose this Villa. It is a home away from home with holiday spirit. It is an ideal Villa for family with young children or for travellers looking for a Villa to have all the privacy.The surrounding is free from noise pollution except for bird singing and jingling from sheep and sea waves. This Villa has a stunning sea view and white mountain views. You can enjoy this views either from the swimming pool or the Villa balconies. Other unique feature of the Villa is that you get balcony for each bed room allowing all guests to enjoy the stunning view from the bed.The Villa is situated in the middle of 1500 sq.mt. land and this land is fully secured by stone wall which gives the complete security and allow the children to freely move around the Villa Garden. The Villa garden has plenty of Olive trees, Palm trees, Apple trees, Pear trees, Plum tree, Apricot tree, Fig tree, Pomegranate tree, Grape tree. The infinity swimming pool has large green grass area with 03 Palm Trees. This Palm Trees give you the opportunity to hide away from the hot sun. These shadow area has sun bed and chairs. Bathroom 1 with bath/shower over, walk in shower, wc. Bathroom 2 with large walk in shower, wc. Large fire place is in the living area. Plenty of parking available in 1500sm land around the villa. We provide unlimited down load wired or WiFi internet. There will be a additional charge of €30 will apply for 07 nights. Contact owner for this service. Open plan dining room/lounge with table and 6 chairs, 3 seater and 2 seater sofas, coffee table, TV/satellite with stand. Sofabed can be provided. Beach towels can be provided with additional charge of €5 per towel for your entire holiday period. All rooms have air-condition units, with hot or cool air option. Swimming pool is 5 metre wide and 10 metre long making 50sqm water area. Depth at shallow end 0.9 metre and depth at deep end 1.9 metre Tiled terrace to the front of house. Sunbeds, parasols and garden chairs provided. Garden table and chairs provided, for dining alfresco. Barbecue house with sink and cupboards, serving worktop. Under stairs storage area houses washing machine, ironing table and iron. Cleaning / Towels / Linen / Maid service: Self-catering. Washing machine and dishwasher provided. Villa is cleaned before arrival. Bed linen and towels are provided for your use. Cleaning services are available for hire from welcome team at your own cost. Internet access will be provided on request and additional charge will apply. 10 sqm Roof tiled barbecue house has grills, cupboards and sink. Swimming pool has outside shower and breathtaking views. Beautiful Villa with an amazing view. Lovely tranquil location. The best you ever can get ! Opnieuw teruggekeerd, met andere familie. En opnieuw een overweldigende indruk van stilte en natuur. De hogere ligging zorgt voor verfrissende wind op warme dagen. En een nieuwe ervaring: cruisen op de zee met een kleine boot van Manolis uit Kefalas. Local leven, met zon, zee en bergen: niet te missen in deze leuke villa met mooi onderhouden zwembad. Our stay at this stunning villa. The villa was magnificent and views were were breath-taking, especially in the evening.The swimming pool was very fun, we enjoyed it. The entire village was welcoming, the food was delicious and there were loads of things to see and do. It was a ten minute drive to Octopus bay, where you can see the coastal line of Crete. It was great holiday and we enjoyed it very much. Thank you for letting us stay at this villa! Wir verbrachten eine wunderschöne entspannte Woche mit der Familie in der Villa in Kefalas. Das Haus ist geräumig und gemütlich eingerichtet, ebenso der Garten. Man hat einen atemberaubenden Blick auf das Meer und angrenzende Buchten und hat es mit dem Auto nicht weit zum Strand, in andere nette Städte oder zum Flughafen. Auch zu empfehlen war die Anreise im Frühling, da alles noch schön grün war und geblüht hat, wobei die Temperaturen noch recht angenehm waren. Des Weiteren muss ich nochmal ein großes Dankeschön an den Vermiter P. Logan aussprechen, der uns bei Fragen oder Problemen immer zur Seite gestanden ist! Sogar als einer unserer Mitreisenden seinen Schlüssel nach Abreise in der Villa vergessen hatte, wurde sich sofort darum gekümmert! Zusammengefasst war es durch und durch ein sehr schöner Urlaub, wobei die Unterkunft hierbei eine großes Stück beigetragen hat. Wir würden nächstes Frühjahr gerne wieder kommen! A paradise of silence and beauty. De locatie van deze villa is uniek. Met zicht op zee en de bergen en in volledige stilte geniet je hier van de natuur. Het mooie zwembad, de schaduw onder de palmbomen, het degelijk uitgerust huis staan garant voor een mooi verblijf. Vooral ook het unieke dorpje waar je in restaurants lekker kunt eten, zorgt voor een authentieke sfeer. De bezienswaardigheden op Kreta zijn vlot bereikbaar. Op amper een uurtje ben je aan de zuidelijke Libische zee met spectaculaire verzichten. Sommige mensen schrijven "hier komen we vast en zeker terug ". The property is stunning. Very clean and equipped with everything we needed for our holiday stay. The beds were comfortable and the fireplace was a cosy and beautiful touch during the chilly evenings. The BBQ facilities and pool outside we also fab. The views were truly breathtaking with Snow capped mountains on one side and water views on the other. They just took our breath away as we inhaled the clear fresh air and heard the faint bells of the local goats grazing nearby. The road leading to the villa was a bit rough but you do get used to it. It added to the rural charm and privacy of the location and made us feel like we were in the the real Crete. The location was convenient to both Chania to the West and Rhethmo to the East. The staff were friendly and very knowledgeable of the area and the owner made the booking process easy to use with prompt confirmations and replies to our requests. Overall, I would highly recommend this villa to my friends and family and look forward to returning for our next holiday. Chania area is rich in historical and archaeological places of interest. Beach resorts. Natural environment, rare vegetation and wild landscape. Villa itself is by coast of Almyros Gulf. Famous beach resorts nearby are Georgioupoli 10 mins drive, Almirida 15 mins drive, Kalives 15 mins drive, Lake Kourna 15 mins drive. Car use is essential. Bike hire is available at Georgioupoli. Two main airports service area - Chania Airport 30 to 45 mins drive from villa. Heraklion Airport 1 and half to 2 hrs drive from villa. Ports in Souda Bay 30 mins drive from villa. A great variety of villages of interest are within very short distances, 10 to 30 minutes drive away - Gavalohori, Aptera, Kokhino Hori, Drapanos, ect. Vamos, 10 mins drive, benefits from a 24hr Health Centre, many taverns to eat and drink. Kefalas itself has several tavernas and small supermarkets/shops. Neighbouring villages, Selia, Litsarda, Xerosteni, etc. also provide tavernas. Vamos is the largest town close to villa. It has banks, 24hr Medical Centre, bakery, butchers, grocery shops and many tavernas. Vamos- Take a walking tour to see the local traditional architecture. Booking Notes: 1) To secure booking a down payment of 25% of total cost is required. Balance 75% payment is required to be paid 60 days before arrival to the Villa. 2) If you wish to pay on your arrival to the Villa then 50% of the total cost to be paid as soon as possible then the balance can be paid on your arrival by cash. However there will be a additional charge of €30 will apply if you are paying any cash at the villa. 3) You can make payments to UK bank account in Sterling or Crete bank account in Euros. And also you can choose to pay in to our Paypal account. 4) Any bank charges or Paypal charges are not included in the total price. 5) If you choose to pay by Paypal, there will be a additional charge of 2.5% will apply unless you choose the correct payment option to avoid any Paypal charges. 6) If you choose to pay in sterling currency, please contact the owner for England bank account details. 7) If you are paying in Sterling currency then the owner will inform you the currency exchange rate. 8) Any bookings 3 weeks or more will have discount. 9) WiFi Internet connection will be provided with your request and there will be a additional charge of €30.00 for 7 nights. We provide unlimited down load of WiFi internet. Changeover Day: Changeover day is flexible. Transport: Transport can be provided from Chania Airport by our welcome team however it is depend on number of people in your group. If you require midweek cleaning additional charge will apply.